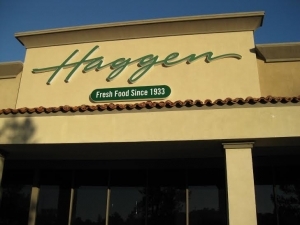 November 19, 2015 (San Diego’s East County) - Over the weekend of November 15th, the Haggen supermarket at 3681 Avocado Boulevard finally ran out of food and other salable items and closed for good. The store, located in the Rancho San Diego Village strip mall, was originally a Vons before Haggen bought the chain out in Southern California and then subsequently declared bankruptcy. Over the month of October the store slowly began winding down operations by not taking in new stock, selling off the food and sundries, and gradually barricading the empty aisles off as the food ran out.